1. Mix cumin powder, chilli powder, pepper powder, salt and oil with the whisked egg. 2. Add the minced chicken and mix well. 3. Keep aside for 5 to 8 minutes. 4. Add the cashew nuts, ginger, onions, coriander leaves and garam masala powder. 5. Mix and divide into equal portions. 6. Wrap them along wooden skewers and prepare as many skewers as possible. 7. Place them in a preheated oven at 150C/300F for 8 minutes, until golden brown, basting with oil once. 8. Remove and brush with butter. 9. Garnish with onion rings and lemon wedges. 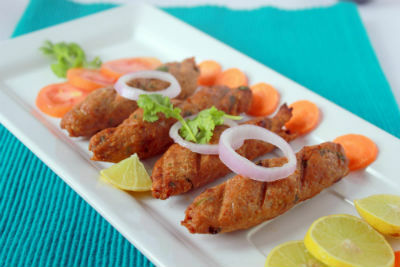 Feel free to comment or share your thoughts on this Murgh Seekh Kebab Recipe from Awesome Cuisine.